Congratulations to Heathrow Haulage on becoming a FORS Gold member. This notable milestone comes at the same time as Heathrow Haulage reports a fuel efficiency improvement of 4.7 per cent in just six months. 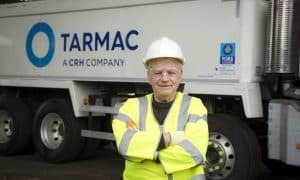 Tarmac has worked closely with Heathrow Haulage in its bid to achieve FORS Gold. In a boost for smaller operators (those with a total fleet no larger than three vehicles), FORS announced in January 2018 the scrapping of its FORS Gold evidencing fee. The move was introduced to incentivise smaller operators to progress through to FORS Gold status and enjoy the many benefits that exemplary levels of best practice can bring. To find out more about progressing to FORS Gold, please visit our ‘Go for Gold’ page.